While thick, fluffy pancakes are a weekend favorite, crepes, the very thin and light cousin to pancakes, can add an air of elegance to a brunch or other special events. 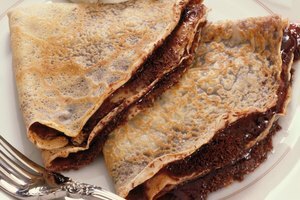 Just as pancakes can be filled with fruits and finished off with sugary toppings, similar fillings such as berries and apples are placed on top and in the center of a crepe to be folded up inside and sprinkled with confectioner's sugar. 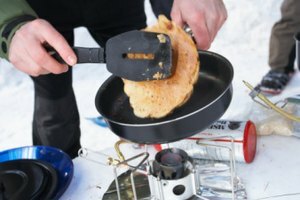 With these easy tricks to make crepes with pancake mix, you'll be trading maple syrup for powdered sugar in no time. Making crepes from pancake batter is quite simple, especially if you are using a premade crepe mix like the one Aunt Jemima produces. Otherwise, using your favorite mix such as Hungry Jack or Krusteaz to make a crepe recipe is a matter of making a slight adjustment. Pancake batter is quite thick, and crepe batter needs to be very thin, just thin enough to cover the base of the saucepan or frying pan that is being used, which is usually between 8 and 11 inches in diameter. Combine half a cup of the pancake mix with half a cup of all-purpose flour. This will make the batter thinner because it will reduce the other ingredients, such as oil and baking soda, that are already present in pancake mixes. Mix with 1 1/4 cup of water to ensure the mixture is as thin as it needs to be and add in two beaten eggs and 2 tablespoons of melted butter. This should yield as many as 24 crepes. Be patient. The sides of the crepe should pull away from the sides of the pan, and the crepe itself should loosen slightly from the pan before you attempt to turn it over to brown it on the other side. A specific type of crepes known as crepes Suzette are easy to whip up using a Bisquick crepe recipe. Bisquick, like other mixes, is thicker for pancakes. 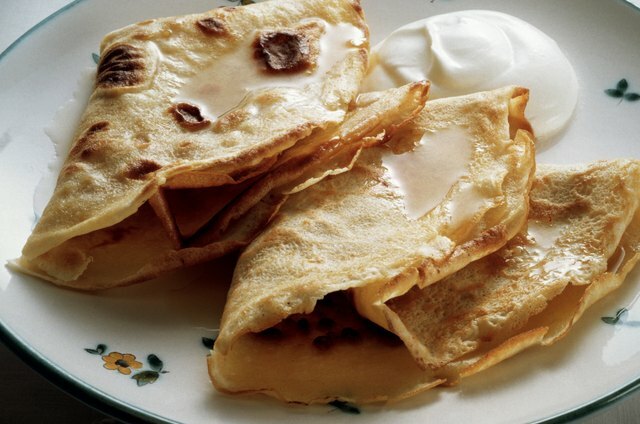 If the crepes are made from pancake batter instead of substituting all-purpose flour, the batter will hold up to the added ingredients in crepes Suzette, which includes orange zest, sugar and additional liquids such as orange juice and orange liqueur. For those who are vegan or avoid dairy products, crepes might appear to be off the menu, as the main ingredients are dairy products: milk, butter and eggs. There is, however, a way to adapt recipes to make crepes without milk. Making crepes without milk can even still be done with a vegan-friendly pancake mix. To make crepes with pancake mix that excludes dairy, use half a cup of the mix and half a cup of all-purpose flour. Swap the 1 1/4 cup of water for 1/2 cup of soy or almond milk and keep the remaining 3/4 cup of water in the recipe. Add 1/4 teaspoon of baking soda to ensure the crepes rise properly and swap the butter with full-fat coconut milk and soy-free margarine. Crepes can be served cold or warm depending on your preferences. 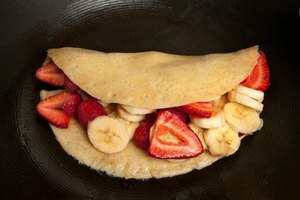 Crepes that are served sweet with lighter, fresh fillings like berries or bananas are great served cold. Smear a little fruit compote or jam onto the crepe before laying the berries for an added layer of flavor. 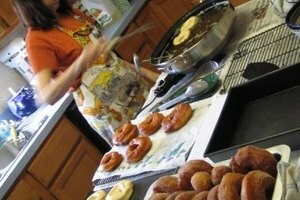 Those that have hot fillings, such as baked apples, are best served warm. Don't forget to top with honey or whipped cream. Crepes can also be made with savory toppings. Fill crepes with shredded cheese, eggs, ham, salmon or cooked vegetables for a light meal. Top with chives, rosemary or thyme.